2 tablespoons canola oil 1/2 small Spanish onion, finely chopped 1 clove garlic, finely chopped 2 large Granny Smith apples, peeled, cored and chopped 1/4 cup water 3 tablespoons light brown sugar 1 teaspoon ground cinnamon 1/4 teaspoon kosher salt 2 sticks unsalted butter, softened Molasses-Mustard Glaze (for pork): 1/4 cup Dijon 2 tablespoons whole-grain mustard 1/4 cup molasses Salt and freshly ground black pepper Pork: 5 cups water 1 container apple juice concentrate, thawed 1/2 cup kosher salt 1/2 cup brown sugar 1 Spanish onion, peeled and quartered 10 black peppercorns 10 mustard seeds 8 sprigs fresh thyme 2 bay leaves 1 (2 1/2 to 3-pound) boneless pork loin, trimmed of fat 2 tablespoons olive oil Salt and freshly ground black pepper 3 shallots, finely chopped 2 cups whiskey (recommended: Jack Daniels) 5 cups homemade chicken stock 1/4 cup light brown sugar 2 tablespoons cold unsalted butter 2 tablespoons finely chopped fresh flat-leaf parsley, plus parsley sprigs for garnish Directions: For the apple butter: Heat the oil in a large saute pan over medium-high heat. Add the onion and garlic and cook until soft, 3 to 4 minutes. Add the apple, water and brown sugar and cook until the apples are very soft. Stir in the cinnamon and salt and cook for 1 minute. Remove the mixture from the heat and let cool. Transfer the mixture to a food processor along with the butter and process until slightly chunky. Scrape into a small bowl, cover and refrigerate for at least 1 hour to allow the flavors to meld. Let come to room temperature before serving. Whisk all the glaze ingredients in a small bowl. Bring the water, apple juice, salt, sugar, onion, peppercorns, mustard seeds, thyme and bay leaves to a simmer in a large stock pot and cook until the sugar and salt is dissolved. Let cool completely. Submerge the roast in the brine by placing a plate on top, cover with plastic and refrigerate for up to 4 hours. 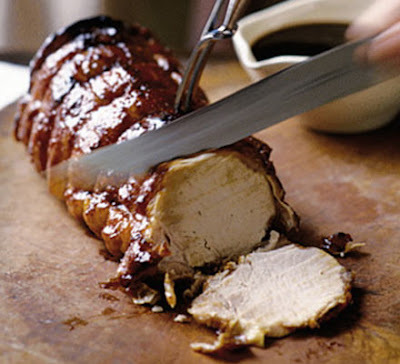 Remove the pork from the brine, rinse under cold water and pat dry with paper towels. Heat the oil in a large saute pan over high heat. Season the pork on both sides with salt and pepper and cook on both sides until golden brown, about 8 to 10 minutes total. Transfer the pork to a baking sheet, brush with some of the glaze and finish cooking in the oven until cooked to an internal temperature of 150 degrees F on an instant-read thermometer, about 30 to 40 minutes, brushing with the glaze every 10 minutes. Remove from the oven, let rest loosely tented with foil for 10 minutes. Add the shallots to the saute pan (that the pork was browned in) and cook until soft. Add the whiskey, scraping the bottom of the pan with a wooden spoon and cook until almost completely reduced. Add the chicken broth and brown sugar and bring to a boil and cook until reduced to a sauce consistency. Whisk in the butter, season with salt and pepper and stir in the parsley. Slice the rack into chops and place on a large plate, drizzle a little of the sauce around the pork chop and top with some of the butter. Garnish with parsley sprigs.